There are many good Android reading apps in 2016. I decided to try out and compare the 8 top rated Android reading apps on Google Play and will share my findings below. The ratings for the apps are as of April 19, 2016. The data about features and options is collected from Wikipedia. FBReader is the highest rated Android reader on Google Play – it has 4.6 stars based on over a hundred thousand votes. Overall it is a nice and easy to use ereader, but some parts of the UI can be confusing. The app is only 5+ mb while other similar apps are 20+mb. FBReader supports 11+ formats, so you don’t have to worry about conversion. Navigation features are good, but there is no support for autoscrolling or continuous scrolling. Display features: all one can wish for, except for CSS enable/disable. Unfortunately, there is no way to highlight or annotate text. Text to speech is supported. There is no book file search. Rating: Rated 4.6 stars out of five stars, based on 163,975 votes. 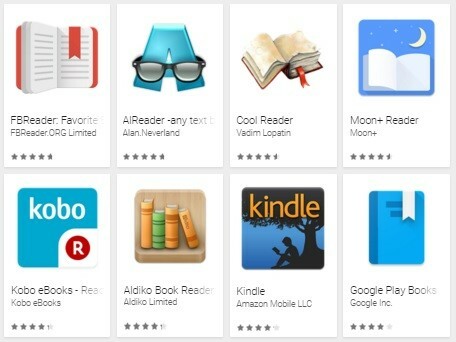 AlReader is the second highest rated Android reader. It has 4.6 stars, but fewer ratings than FBreader. I like this program – it is fast and user friendly, there are no ads. However, there are a couple of shortcomings. There is no CHM file format support – a lot of tech books use that format, and there is no PDF file format support. AlReader supports 9+ formats. All navigation features are supported, except for rolling blind mode. Most display features are offered, except for CSS enable/disable and a couple others. Text to speech is supported. All book sources are supported except for browser downloading. Rating: Rated 4.6 stars out of five stars, based on 64,271 votes. This is the third top rated Android reading app – 4.5 stars. It is a nice and very customizable reader. The design looks a bit “ancient”, but navigation is quite intuitive. The app sadly does not support PDF. And finally the app seems to have a persistent app – you have adjusted the screen orientation settings, the screen rotation does not lock in place once. Cool Reader supports fewer formats (9+). Navigation options and display features are similar to FBreader, but sadly syncing to cloud is not supported. All book sources are supported except for browser downloading. Rating: Rated 4.5 stars out of five stars, based on 215,245 votes. Moon+ Reader has 4.4 stars. It is a nice app with clean and simple interface and excellent PDF support, but it allows intrusive full screen ads and animated ads in book shelf view. Moon+ Reader supports 8+ formats, but Microsoft Word .doc and .docx files are not supported. This page turner has the largest number of navigation options among the 7 best Android reading apps. It also has the largest number of themes – 10; all display features are supported except for image view with zoom/pan. All ebook sources are supported except for browser downloading. Rating: Rated 4.4 stars out of five stars, based on 209,185 votes. Kobo is the fifth rated Android page turner. It has 4.2 stars. Overall it is a good app for shopping for books, and it is easy to find a nice free book through their catalogue (the first book of a series is often free). Sadly though, Kobo does not support some major formats including .pdf, .mobi, .doc. There is no TTS support. There is no Sync option and no TTS support. Kobo only supports 4+ formats. Navigation: Kobo does not support autoscrolling, continuous scrolling or scrolling speed control. Kobo is quite limited in display features – no themes or even customizing text alignment. Edit tool does not include metadata edit, translate, or gesture commands. Rating: Rated 4.2 stars out of five stars, based on 195,014 votes. Aldiko reader is a tie with Kobo – 4.2 stars, but fewer ratings. It is an easy to learn and reliable app, clean and low memory. Unfortunately, only two formats are supported, there is no built-in dictionary, no Text to Speech and no translate. Sync to cloud is not supported, so if you lose your phone or tablet, you may lose all of your books as well. Only 2+ formats are supported. Navigation does not support autoscrolling or continuous scrolling. Aldiko is somewhat limited in display features, but themes are supported. Book file search is not supported. Rating: Rated 4.2 stars out of five stars, based on 194,443 votes. Kindle app has a rating of 4.1 stars. It is a nicely done app meant to connect your Android device with the Kindle shop. To start using the app, you need to login using your Amazon account. Amazon is the largest book retailer in the world, so you are bound to find many titles in the genre you like and to easily purchase books. Whispersync technology is convenient to switch between reading and listening. You don’t have to look for the last reading place because it saves it automatically, like a bookmark. However, this app takes more memory than other similar reading apps. There is no option to move files to external memory card. Kindle supports only 3 formats. Navigation features are good, but autoscrolling and continuous scrolling are not supported. Display features are quite limited, and there are no themes and no night mode. There is no metadata edit. Rating: Rated 4.1 stars out of five stars, based on 538,017 votes. Google Play books has 3.9 stars with over a million votes. This is a nice app with a stable interface and nice features like turning PDFs to night mode. However, some of its features rub the users the wrong way. First, you need to specify your credit card information even to read a free book. Second, you cannot sort books – there is no bookshelf where you could arrange the ebooks into folders or categories. You cannot search your library either. The app supports only 2 formats – .epub and .pdf. This app supports Syncing to Cloud. Autoscrolling and continuous scrolling are not supported. Display features are average; themes are not supported, but there is night mode. Rating: Rated 3.9 stars out of five stars, based on 1,094,757 votes. My favorite is Moon+ Reader. I own the pro version. The free version has quite obtrusive ads, and I eventually decided to pay for the pro version in order to get rid of them. The app has lots of handy settings to make reading better. You can keep the reader’s default page flip settings, which is scroll down, or you can set it to use buttons on your device to flip the pages. You can set the background color – I usually choose light grey. You can choose the font, alignment, and the margin from each side. Page animation – I usually choose Google page flip effect which I think is very attractive. The app has five different page flip animations to choose from, and you can customize each page turning effect and change its speed, color and transparency. Another thing I really like about this application is that if you choose auto scroll mode, it has 5 different modes, but even more important is that it allows for real time speed control. The app also supports the new .epub3 and multimedia content inside of it – video and audio. It has a backup and restore option, such as to your Dropbox account, and also allows you to sync everything between your phone, tablet and other devices. The newest version has a very good support for PDF files. Many of the same features are present in other reading apps, but I believe that Moon Reader has been getting progressively better over time, while some others seem to go downhill after updates. My second favorite Android ereader is Cool Reader. Which top rated Android reader do you think is best and why?